The chapter deals with the health status of the Arab Israeli population compared to the Jewish population in a number of areas, including the risk factors characteristic of the Arab Israeli population and access to medical services. Over the past 40 years, the gap between Jewish and Arab Israelis in life expectancy has increased for those who are currently 30 years old, and in the past two decades the widening of the gap has accelerated. In other words, the relative deterioration in the health of the Arab Israeli population stems primarily from the health status of adults, especially men. Data from the Central Bureau of Statistics’ (CBS) Social Survey indicate that about half of the sample population self-report “very good” health, both among Jews and Arab Israelis. Of the remaining half of the population, a higher percentage of Arab Israelis than Jews reported that their health was “not so good” or “not at all good.” However, the existence of health problems was reported equally by the groups. This was not the case, though, regarding the severity of the health problems – the share of those reporting a health problem that interfered with daily functioning was over 10 percentage points higher in the Arab Israeli sector than in the Jewish sector. The life expectancy of the Arab population in Israel (79 years) is the highest in the Arab-Muslim world, but it is low compared to the Jewish population (82.7 years) and the OECD average (81.6 years). There are substantial gaps between Jewish and Arab Israelis in infant mortality: Among Jews, the mortality rate was 2.7 per 1,000 births, compared to 3.4 among Druze, 3.0 among Christians, and 7.5 among Muslims. Infant mortality specifically, and longevity in general, are related to the socioeconomic situation of the population. In these measures too, Arabs in Israel are better off than are those in other Arab-Muslim countries. 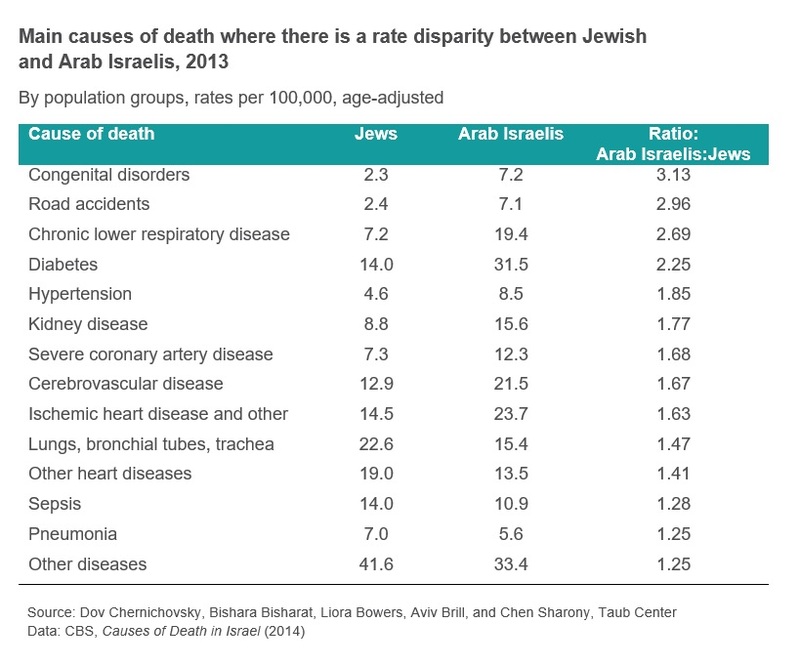 The leading causes of death for Arab Israelis differ from those of Jews. Particularly prominent among Arab Israelis are birth defects, road and work accidents, and relatively high rates of chronic disease. Some of the differences can be explained by social characteristics of the Arab Israeli population such as the marrying among relatives, which increases the chances of birth defects, and high rates of smoking (44% of Arab Israeli men smoke, compared with 22% of Jewish men). Given its economic situation, the Arab Israeli population depends on public funding for healthcare than the Jewish population. This dependence is also reflected in a higher share of Arab Israelis who forgo medical treatments due to financial difficulties than the share among Jews. The CBS Social Survey shows that about one-third of Arab Israeli patients have gone without prescription medication because of financial reasons. In districts with a high concentration of Arab Israelis – in Haifa, Jerusalem, and especially in the North of the country – there is a shortage of doctors and medical equipment. In addition, the average distance between Arab Israeli localities and a hospital is approximately 22 kilometers, compared to 14 kilometers for Jewish localities. The share of those who report using private health services in the Jewish population is almost double that of the Arab Israeli population: about 22% compared to 11% respectively. The main reason cited for using private health services within the Jewish population is the ability to choose one’s doctor, and within the Arab Israeli population is the inability to receive public services. Arab Israelis engage less in preventative measures and visit medical specialists less often, but tend to visit family doctors and hospitals more often. In other words, medical services tend to be used by this population only when health has deteriorated. This pattern is common among most low-income groups, and may also be influenced by cultural characteristics.